The quality of a product reflects the quality of an entire company. Quality assurance according to German standard covers all our company activities, from development and manufacturing to administration and logistics. We offer a wide range of window styles, including single, double, 3-panel, and folding sliding, as well as windows that tilt and turn, and windows that are side hung or top hung. Choosing a suitable window for each situation can therefore be a daunting task. Don’t worry. Our experts are here to help you make the best choice to ensure your new windows do not only look great, but are practical and serve their purpose well. Multi-chamber design to improve heat- and sound-insulation. Intersecting drainage system to enhance air and water proofing. Uniform location features to allow combining various profiles. Spacious steel chamber to strengthen the uPVC windows and doors. Bridge feature at intersections to improve window tightness. Integrated insect screens to keep out home invaders. Fixed or sliding panels certified up to 3 meters high. Modern streamline look that is appealing to the eye. Main surrounding frame can be hidden in the floor, walls and ceiling. Design based on quality, effectiveness & built to last. 1 to 4 rail sliding track made to order. Designed for heavy loads including bullet proof glazing options. Whether you are looking for an entrance door or doors leading to your garden, we’ve got you covered. 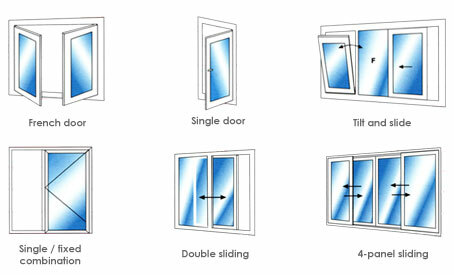 Besides standard single and French doors, we also offer sliding doors with up to 4 panels, as well as doors that tilt and slide. And if size matters in your situation, our Pellucid sliding glass walls can be as high as 3 meters with an unlimited length. Let our experts help you select from our wide range of door styles to ensure your new doors are inviting and perfectly match your requirements.